Tramezzini are popular Italian finger sandwiches that are perfect for snacking. 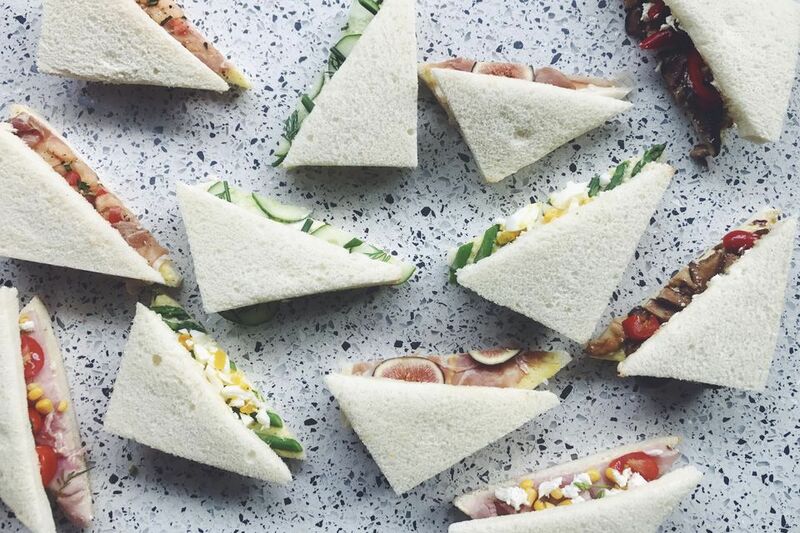 Similar to English tea sandwiches, these flavorful triangular sandwiches are made with crustless soft white bread and homemade mayonnaise. They're typically served and sold between breakfast and lunch at many restaurants and bars in Venice, Italy. To make these petite Venetian snacks, it's crucial to start with some really good homemade mayonnaise. To make this Italian variation, made with Extra Virgin Olive Oil, simply blend the following ingredients together—reserving the oils. 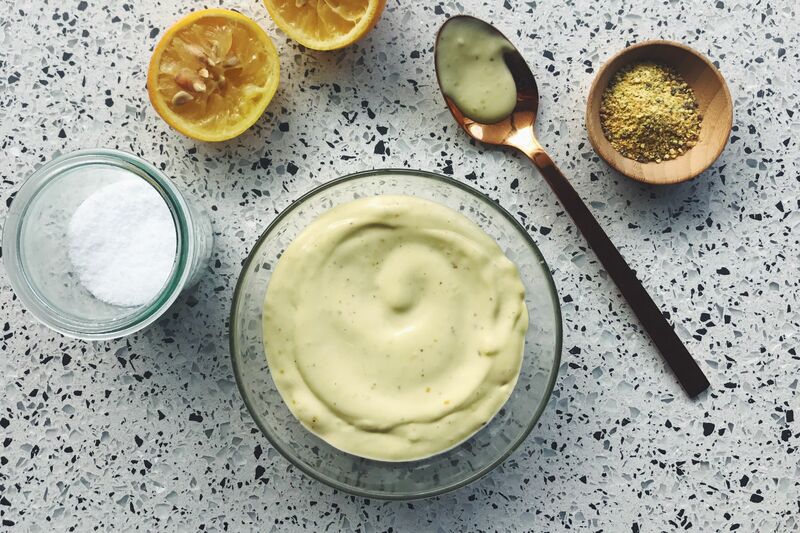 Once it's thoroughly combined, slowly whisk in about a half cup of olive oil and a few tbsp avocado oil until it reaches the desired consistency. Season to taste and get ready to make some of these addictingly cute Italian snacks! Instructions: Smear on a medium-thin layer of the homemade mayonnaise onto a slice of crustless white bread and top with chunks of canned tuna, olives, egg, and scallion. Add a thin layer of the mayo to the top slice of bread and slice diagonally to create two triangles. Instructions: To make the cantaloupe bruschetta, mix together the cantaloupe, cherry tomatoes and basil in a small bowl and set aside. Smear on a medium-thin layer of the homemade mayonnaise onto a slice of crustless thin white bread and top with the prosciutto and the cantaloupe bruschetta. Add a few cranks of freshly cracked black pepper. Finally, add a thin smear of the mayonnaise to the top slice of bread and place it on top. Slice the sandwich diagonally from corner to corner to create two triangles. Instructions: To make this variation, smear on a medium-thin layer of the homemade mayonnaise onto a slice of crustless thin white bread and top with the cucumber slices, chives, dill and 2 pinches of flake salt. Add a thin smear of the mayonnaise to the remaining slice of bread and place it on top. Slice the sandwich diagonally to create two triangular sandwich halves. Instructions: Smear on a medium-thin layer of homemade mayonnaise onto a slice of crustless thin white bread and top with the soft boiled egg coins, pickled beet squares, and capers. Add a thin smear of the mayonnaise to the remaining slice of bread and place it on top. Slice the sandwich diagonally from corner to corner to create two triangular sandwich pieces. Instructions: Bring water to a boil and drop in asparagus. Cook for a minute or two until they turn bright green. Remove from boiling water and shock in ice water. Remove, dry, and set aside. Next, smear on a medium-thin layer of homemade mayonnaise onto a slice of crustless thin white bread and top with the blanched asparagus and the chopped soft boiled egg. Sprinkle with flaky salt and add a thin smear of the mayonnaise to the remaining slice of bread and place it on top. Slice the sandwich into two triangles. Instructions: Begin by sautéing eggplant in olive oil. Season with salt and pepper and finish it with a splash of balsamic vinegar. Then smear on a medium-thin layer of homemade mayonnaise onto a slice of crustless thin white bread and top with the salami, eggplant, torn mozzarella and basil leaves. Lastly, add a thin layer of the mayonnaise to the remaining slice of bread and place it on top. Slice the sandwich into two tasty triangles. Instructions: Begin by frying the pancetta over low heat until it's crispy. Smear on a medium-thin layer of homemade mayonnaise onto a slice of crustless thin white bread and top with crispy pancetta, soft boiled egg slices, parmesan and fresh black pepper. To finish, add a thin layer of the mayonnaise to the remaining slice of bread and place it on top. Slice the sandwich in half from corner to corner. This light and flavorful tramezzini is packed with marinated artichoke hearts, fresh basil, red pepper flakes and lemon zest. Here's what you'll need to make it. Instructions: Add a thin smear of homemade mayonnaise onto a slice of fluffy crustless white bread. Add the halved marinated artichoke hearts, basil, lemon zest + red pepper flakes. To finish, add another thin layer of the mayonnaise to the remaining slice of bread and place it on top. Slice the sandwich in half to create two triangles. Instructions: Add a thin smear of homemade mayonnaise onto a slice of fluffy crustless white bread. Add a layer of mozzarella followed by the tomatoes, basil, pepper, and salt. To finish, add another thin layer of the mayonnaise to the remaining slice of bread and place it on top. Slice the sandwich in half from corner to corner to create two triangles. Instructions: Begin by adding a thin smear of homemade mayonnaise onto a slice of store-bought crustless white bread. Add the prosciutto, the figs, and the salt flakes. To finish, add smear the remaining slice of bread with the homemade mayonnaise and place it on top. Slice the sandwich create triangles. Instructions: Start by adding a smear of homemade mayonnaise to a slice of fluffy crustless white bread. Add arugula, salami and shaved pepato asiago. Finish by smearing the remaining slice of bread with the olive oil mayonnaise and place it on top. Slice in half from corner to corner. So now that you've got 15 different ways to fill your tramezzini, it's time to get creative! For more variations, just think of each sandwich as a way to combine your favorite Italian flavors and have fun! As long as you have soft, white bread and some really good homemade mayo, you can't go wrong.